The security risks generated by the unsanctioned presence of Russian troops in the area, energy security in Eastern Europe, as well as the reforms were discussed at a meeting of the Presidents of Parliament from Moldova, Georgia, Ukraine with members of the US Senate Foreign Policy Committee. Parliament Speak Andrian Candu requested full and active engagement of the United States in promoting democratic values, implementing reforms and ensuring security in the region. Together with his counterparts in Georgia and Ukraine, Andrian Candu thanked the US for support and encouraging messages. They have received assurances to support the regional cooperation project for security and European integration, launched in Chisinau in March this year. 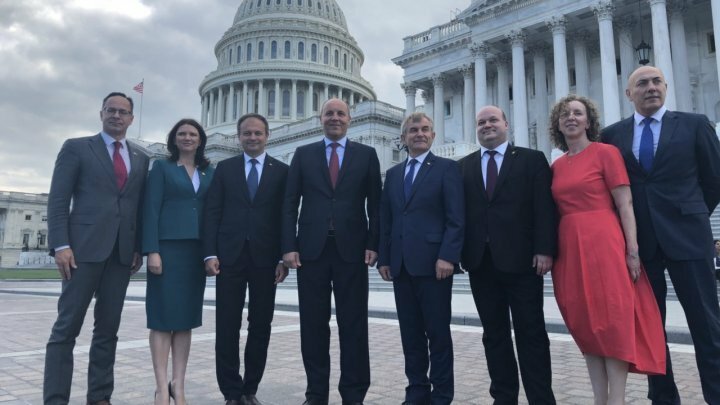 The parties discussed the importance of the resolution in the US Congress for Moldova, as well as the resolution that supports Moldova, Georgia and Ukraine. Also, the issue of Nord Stream 2, a project seen as a threat to energy security in the region, has been addressed. Parliament Speaker Andrian Candu, together with his counterparts in Georgia and Ukraine, accompanied by the Lithuanian Parliament Speaker and the Vice-President of the Senate of Poland, are making a trilateral visit to the USA for the first time between 25 June and 1 July.